So far, two candidates have officially announced their candidacy for Iran's next president. 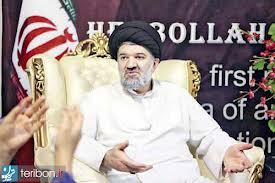 The latest one is the pilot cleric, Mohammad Bagher Kharrazi, the head of Iran's Hezbollah Party. Mohammad Bagher's father, Mohsen, is a member of the Guardian Council. One of his brothers, Kamal was the Iranian foreign minister, under Khatami and his other brother, Sadegh, was Islamic Republic's ambassador to France under Khatami. His sister, is also the Supreme Leader's daughter-in-law. "Everyone knows I am a pilot and I have a Master's Degree, and God willing, I will soon have a PHD too. Hopefully I will arrive at the Presidential Palace with a plane that I will pilot myself. I want to do this so that people don't think I am one of those two to a penny clerics from the outbacks. He rebuffed the way some Iranian officials go out of their way to show off their humble living and said there is nothing wrong with being wealthy and called himself a "de-lux cleric". - To build the biggest aeroplane factory in the world which will provide Iranians with Air Taxis. Mohamad Bagher Kharrazi also said, there will be no "red lines" that he will not cross in his government other than that of the Supreme Leader. He said he has one and a half million activists to help him with his election campaign. It doesn't matter which Khamenei stooge put's himself forward---it's already being predicted that this election will be the most rigged in Iran's history: Khamenei and his best baboon puppet wins again! With Assad's Tombstone probably reading 2013, we can only home that the next graveyard will be for the theocratic Gestapo tyranny of the black buzzard Regime!